A colder than normal North American winter saw the entire surface areas of Lakes Superior, Huron, and Erie frozen over for the first time in years. The cold has delayed the opening of the St. Lawrence Seaway and will likely delay the start of the growing season near the Great Lake shorelines. 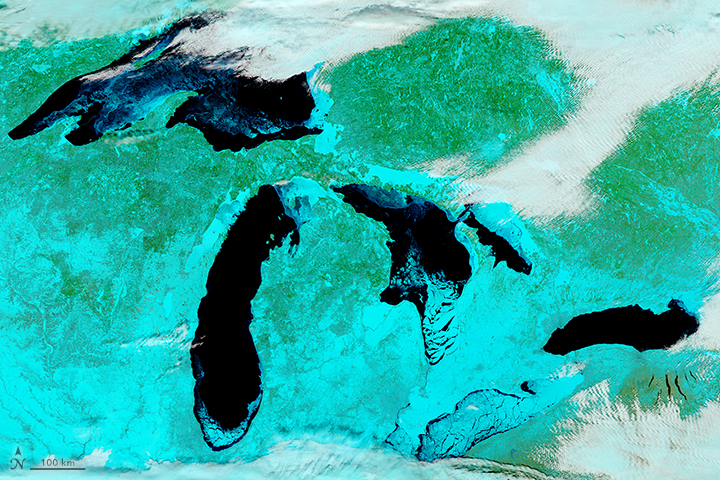 Although the open surface waters of Lake Michigan did not freeze this season, the southern portion experienced a higher than normal amount of ice. Winds and currents drove broken pieces of ice from the north to the south. 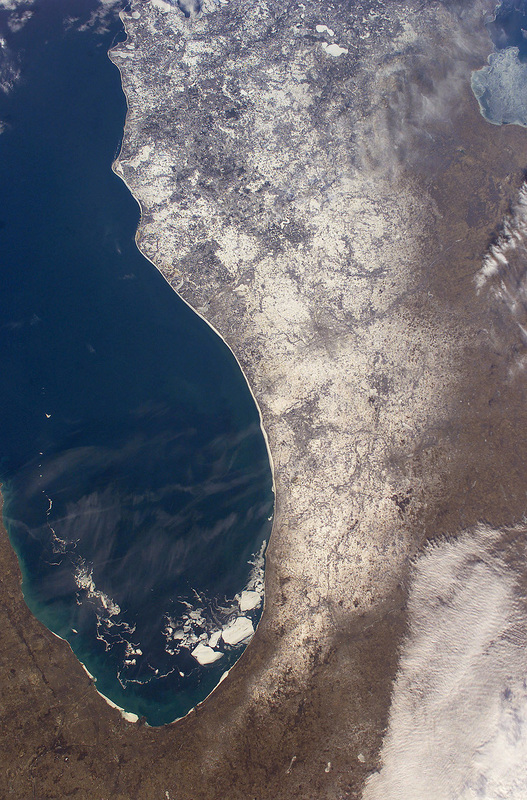 This image taken from the International Space Station shows a number of large pieces of ice collected along and just off the shoreline southwest of Benton Harbor, Michigan. Smaller pieces trail northward offshore from Chicago, Illinois. Note the ice accumulation along the entire eastern shoreline of Lake Michigan as well as the wind-drive lake-effect snow cover over the western half of the lower Michigan Peninsula. Astronaut photograph ISS006-E-29393 was taken February 21, 2003 with an Electronic Still Camera equipped with 28 mm lens and is provided by the Earth Sciences and Image Analysis Laboratory at Johnson Space Center. Additional images taken by astronauts and cosmonauts can be viewed at the NASA-JSC Gateway to Astronaut Photography of Earth. 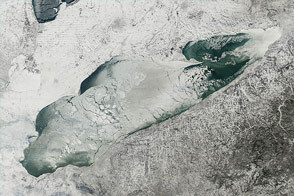 In 2003 a colder than normal North American winter saw the entire surface areas of Lakes Superior, Huron, and Erie frozen over for the first time in years. 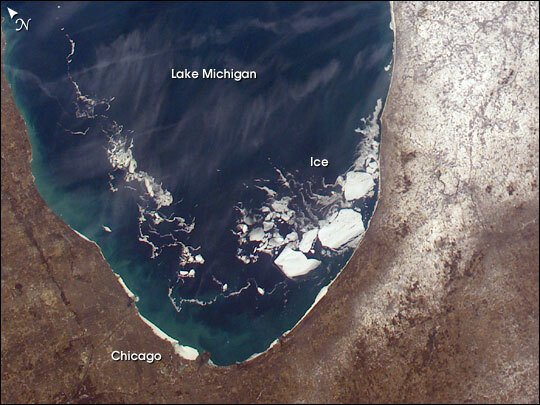 Although the open surface waters of Lake Michigan did not freeze this season, the southern portion experienced a higher than normal amount of ice. Winds and currents drove broken pieces of ice from the north to the south. 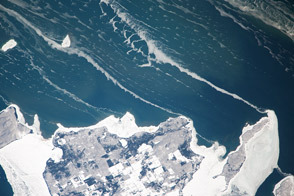 This image taken from the International Space Station shows a number of large pieces of ice collected along and just off the shoreline southwest of Benton Harbor, Michigan. Smaller pieces trail northward offshore from Chicago, Illinois. Note the ice accumulation along the entire eastern shoreline of Lake Michigan as well as the wind-drive lake-effect snow cover over the western half of the lower Michigan Peninsula.